I feel bad for posting this because I know everyone will be REALLY jealous of our kitchen... har har. No, but seriously, it has potential! 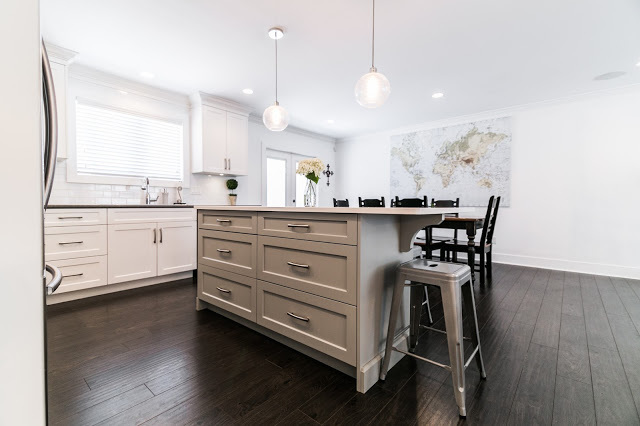 That's what I keep repeating to myself every time I can't fit the groceries from the Costco run in our fridge, or water spills over the too-small sink onto the floor or I glance at my feet and look at the floors... and then, I think - hey, I have a kitchen! There's food in my fridge! 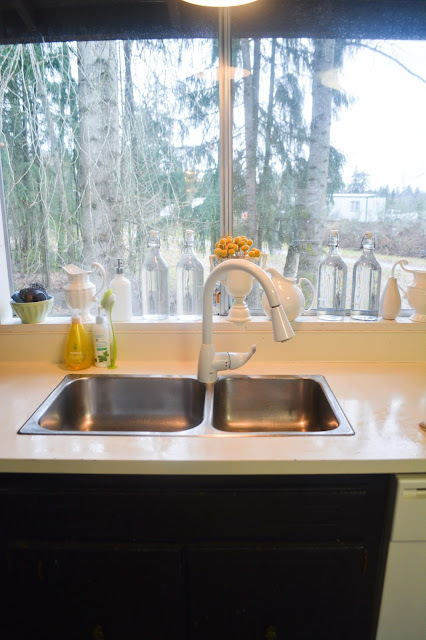 There's clean, running water and why do I care that I don't have gorgeous counter tops? Honestly, none of this matters but it's still fun to talk about it and work toward our dream. Anyway, enough justifying. I don't know why I feel so guilty about wanting a gorgeous kitchen, especially since we'll be doing this on a very modest budget. 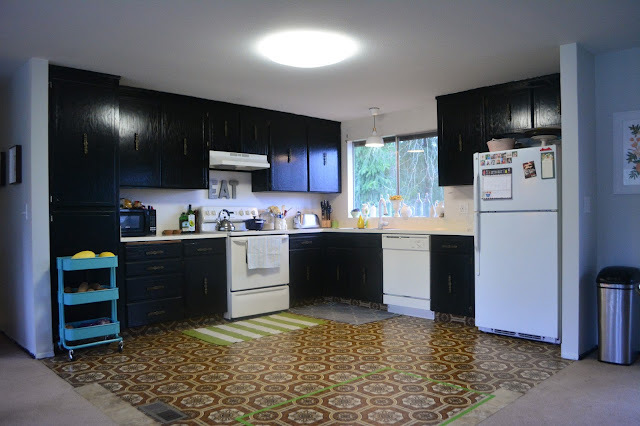 We've toyed with the idea of doing a mini-renovation because I am SO sick of not having any prep area and would love to buy this island to use until David can build a permanent one during our full renovation. I think it would repurpose really well in our laundry room to use as a folding station after it's served its purpose in the kitchen. However, we'll see how things unfold as we work on all the other projects. 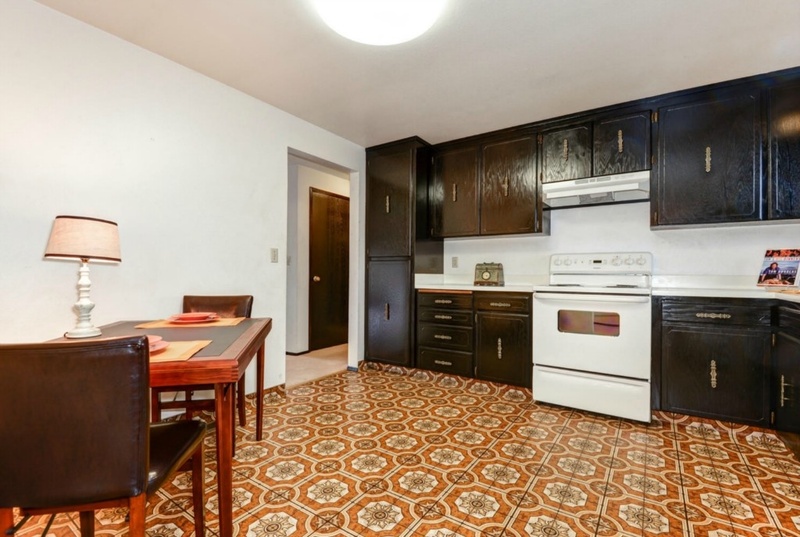 So, let's start with a tour of how the kitchen looked when we bought it. It was a tiny little square with a wall that separated it from the living and dining room. Before we moved in, David ripped that sucker down and it really opened everything up! Then he temporarily put down some vinyl pieces to fill in the gap where the wall was and that's what we are rocking right now. Other than that, we haven't changed anything in here (except we changed the light over the sink temporarily because the other one was broken). 1. This hardware in the center of the door. I mean, what?! It's so bizarre and they're kind of atrocious. I will NOT miss them. 2. 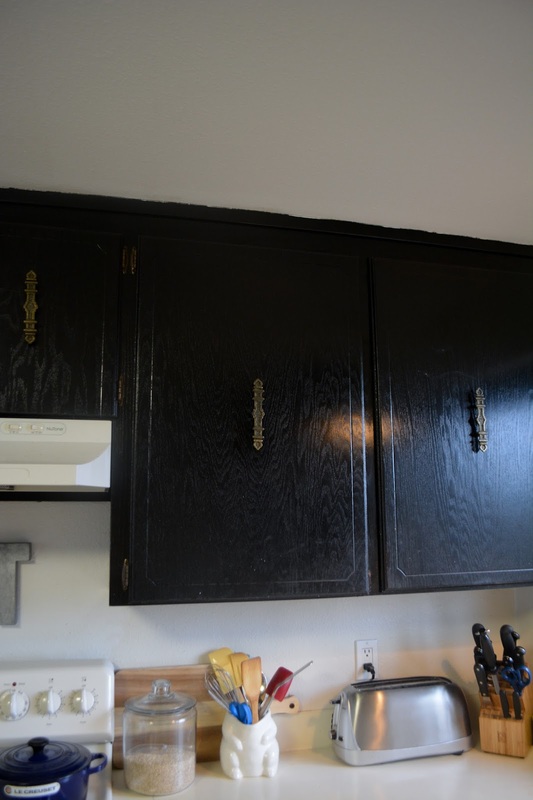 The black cabinets are grainy and gross. I have contemplated working around them but they are so crummy. Beyond the fact that they're just really old, the drawers stick really badly and I'm not sure how well I could cover up the grain without hiring someone professionally to do it... and then I may as well just replace them. We have already priced out and designed our IKEA kitchen so we have a number that we're working with into our budget. 3. The sink and faucet... are not MFEO. I'll tell you that for free. This sink doesn't fit 90% of my pots and pans and has the disposal on the wrong side. 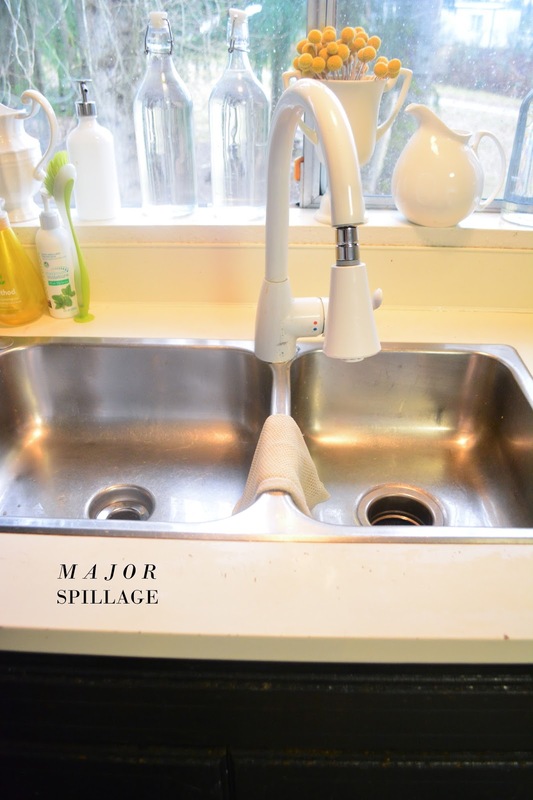 The best part is the faucet whose bridge comes passed the front edge of the sink so if it's in a straight position, water will spill all over the floor. It's the best! I love it! Let me tell you, lots of bad words under my breath. 4. 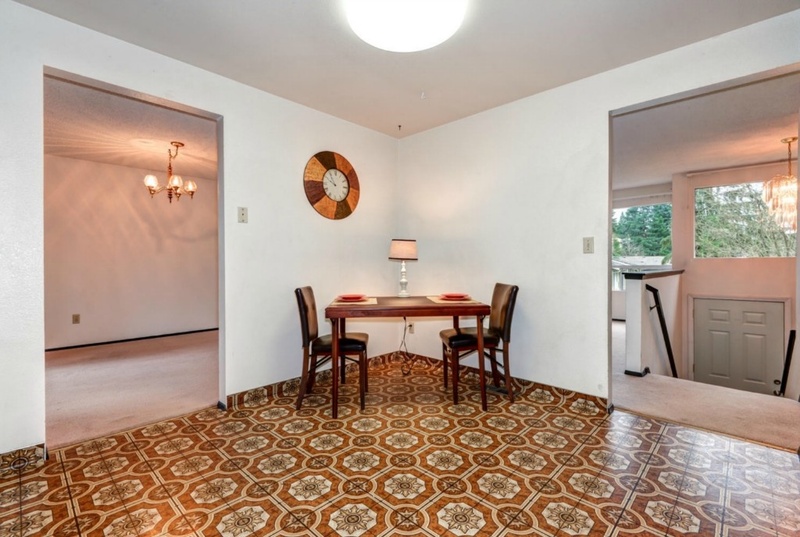 The lovely vinyl floors circa 1976. These are going soon and I cannot wait! David is ripping out all the flooring upstairs and replacing it with laminate wood flooring (real hardwoods will have to wait for our dream house someday). 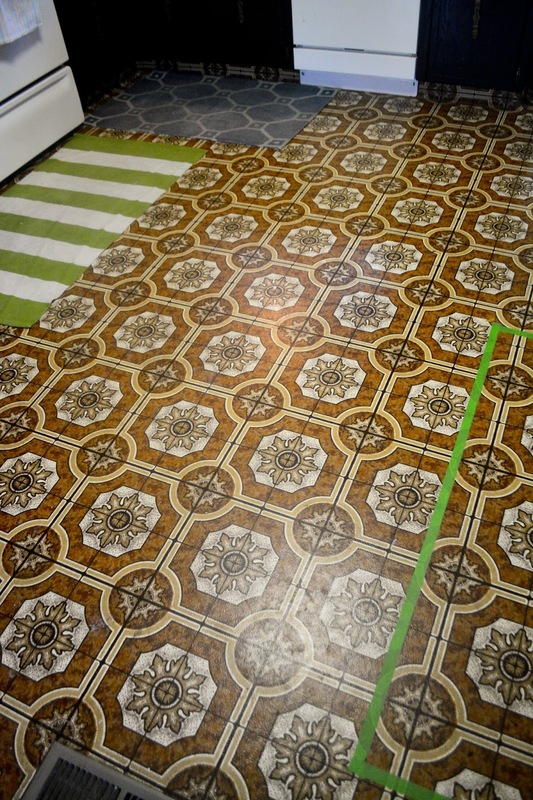 FYI - the green tape is where I've been measuring island size possibilities. 5. The fridge that came with the house is the same one I had in college. So, I try to fit all of our food for a family of 5 in this apartment size fridge. It's not fun but I just have to take deep breaths and remind myself how lucky I am to have a fridge at all. I will be happy to have a new refrigerator! Tell me your best tips for appliance shopping! Lastly, as you can see from this picture, we'll also be taking down the "X"ed spots. The skinny wall on the right was the other half of the doorway from the wall David removed. Removing that will give us more counter space too as we move the fridge and elongate the counters. The "X" on the left is going to go when we replace the floors. It's currently a coat closet that we won't need anymore once the mudroom is finished downstairs, and will be a stair railing. Now, for the pretty pictures. This is what I have in mind. I want to make sure I make classic choices that are modern, and that I'll be happy with should we stay here long term, but that will also be classic enough for resale. 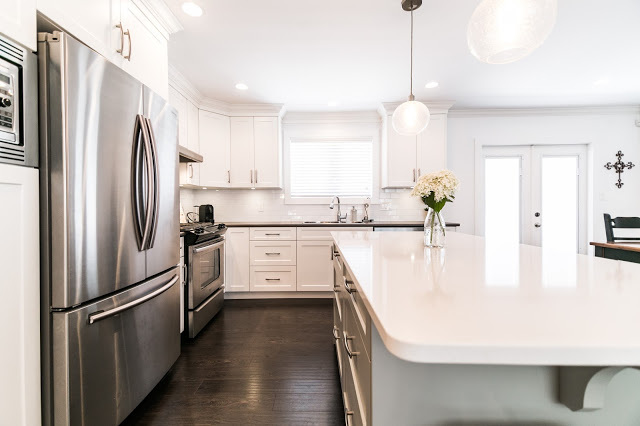 With that in mind, I feel like white cabinets are not only currently on-trend, but also really traditional. I'm envisioning a classic Shaker style cabinet with simple hardware. I love the look of dark blue painted lower cabinets but, because I am trying to be traditional, I am thinking that I may only paint the island blue. That way, should we sell the house in the next few years, I can paint it white again if we feel it might help sell the house a little better. Pacific Northwesterners don't always have my same style, which is maybe more Southern California/Texas. I don't know. I found this blog renovation that is almost identical to our house layout. Seeing their before and after gave me so much hope! 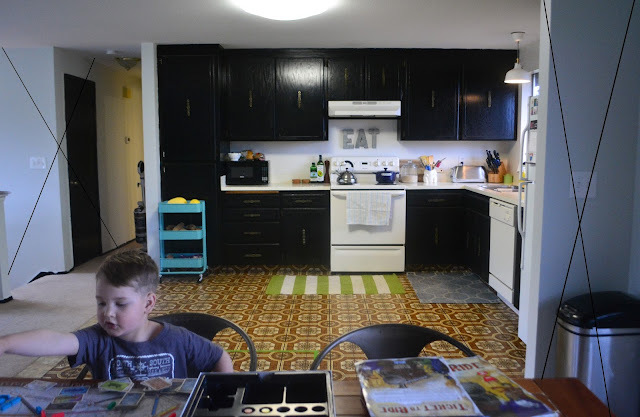 They started with essentially the exact same kitchen we have and I would like to copy most of this (thought I'd like to add just a little color here and there). Can you envision it??? 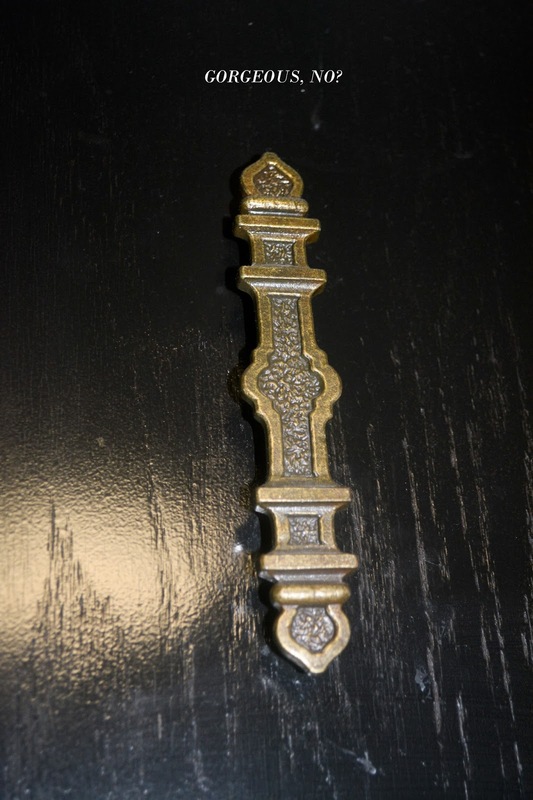 I also love the brass/gold hardware with blue trend, but I need to make sure I find just the right style and hue, all while staying relatively inexpensive. Hardware can get really pricey but it's like jewelry, right? There are so many great options and, when it's actually time to choose, I'm confident I'll be able to find something that will work. 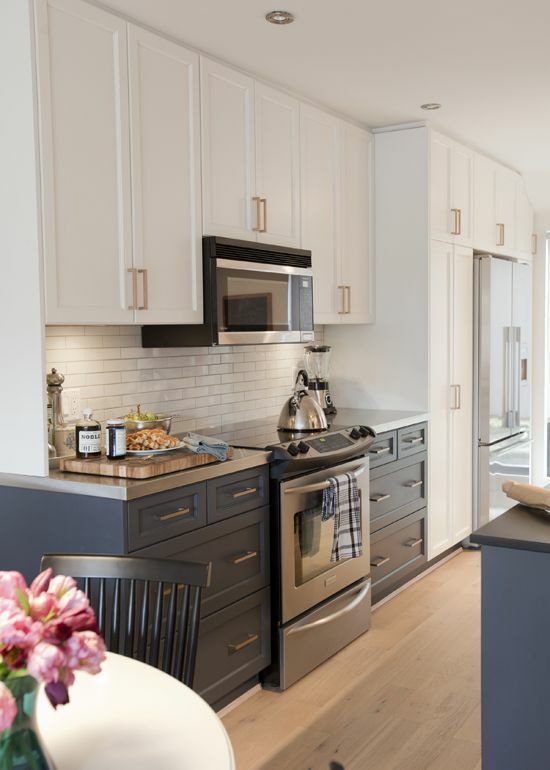 This has been one of my favorite kitchens for a long time and I'd love to do some of these elements, like the blue lowers and white uppers, white subway tile with touches of wood. I bought all new appliances for my tiny little condo last Christmas. I went through Home Depot but ended up hating my fridge and got them to take it back (which was kind of miraculous.) The Home Depot installers and the process (not being able to actually see the appliances I chose in person - only seeing them online) were not my favorite. I also hated going into the store and never being able to find someone to help me. I ended up finding my fridge at a "mom and pop" store in Renton called King & Bunny and I loved the experience. I wanted a bigger fridge than my current one (duplicate to yours, I think!) but Home Depot told me I couldn't get a bigger one to fit through my door. King & Bunny said "we'll do whatever it takes to get the fridge into your kitchen" and they did. They were more concerned with me being happy than just making a sale and I loved that. So that's my recommendation...don't go to the big box stores if you can. You'll get much better service from an independent seller and their prices were very comparable. Yes the big stores can have some screaming deals but it just wasn't worth it to me. Renton isn't too far from where you live if you want to check them out (I get no cut - I just really liked them!) Oh and I replaced my sink (which wasn't as horrible as yours but was almost as bad) with a one bowl composite sink. It makes me so happy...who knew a girl could love her kitchen sink but I totally do! I can actually lay a big ol' cookie sheet flat in the bottom to wash it. It's the best! If you know anyone who works at Whirlpool (or a similar company), then see if you can use their friends & family discount. 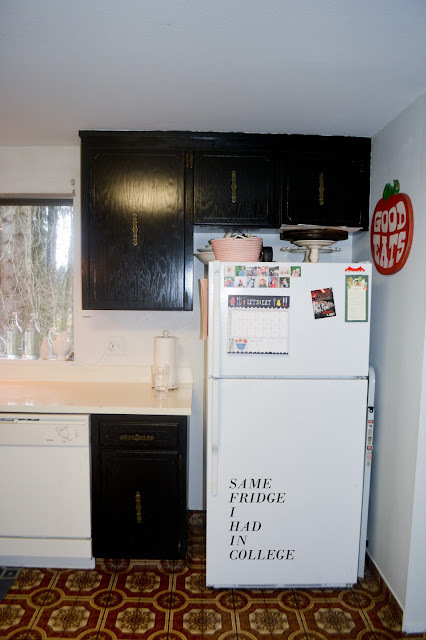 My mom just got a total steal on a side-by-side stainless KitchenAid 'fridge thanks to another guy who is in the stake presidency with my dad & works for Whirlpool! I wish we knew someone with a hook-up at Whirlpool. I've already picked my dream fridge and I love the Whirlpool options! When we remodeled our kitchen we bought 4th of July weekend. That is the cheapest appliances will be all year. We bought at Home Depot and got a great deal but definitely price match. Most stores will price match and some even give an additional 10% off. 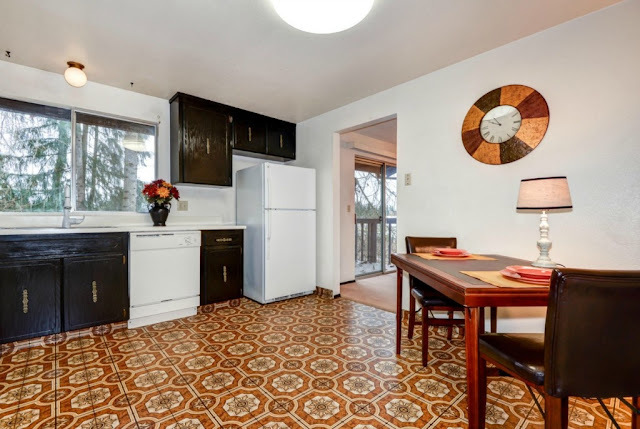 We had a horrific kitchen and we remodeled it a little over a year ago. Let me grab pictures and I will post and tag you on fb when I upload them. Hey Kate! I've loved following your kitchen renovation pictures on Facebook. You guys did a great job! And that squishy baby of yours is delightful too!!! I've been reading your blog for a few years now but have never commented; however today I was compelled to say something. Your kitchen has SO MUCH POTENTIAL! So many people can't see past the present to imagine the future but you have that gift. it will be beautiful!! I love love love the blue cabinets!! I can't wait to see how this all unfolds. Keep the faith!! Thanks Betty! It's so fun to dream about all the possibilities. I LITERALLY have dreams about my house. Haha!